Ever wished that you can enjoy a truly lag-free experience when you watch movies or engage in an online gaming session? Wishes do come true, thanks to StarHub and Linksys. 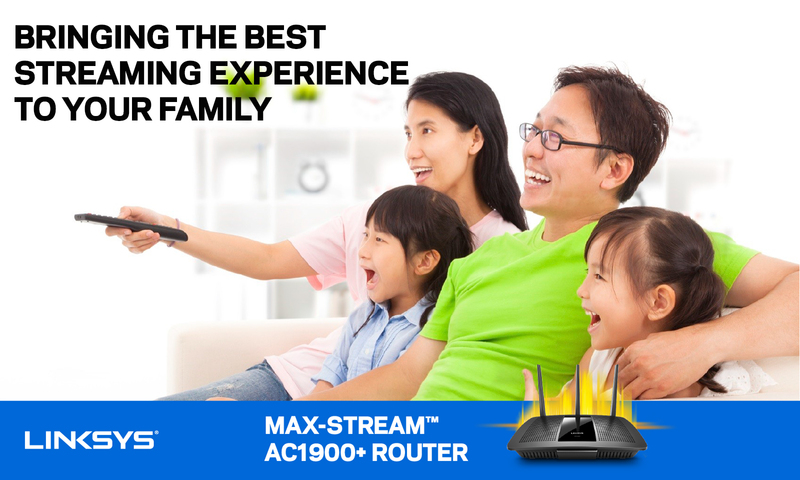 To satisfy Singaporean households’ need for ultra-fast internet access, StarHub and Linksys have come together to exclusively bring the Linksys EA8100-AH MAX-STREAM AC2600 Multi User-MIMO Router to your home. After all, you deserve the best, and that is exactly what StarHub and Linksys want for you. Your weekends will be filled with entertainment. Gather the family and enjoy the latest movies as they instantly stream to your TV via StarHub’s 1Gbps Fibre Broadband connection. 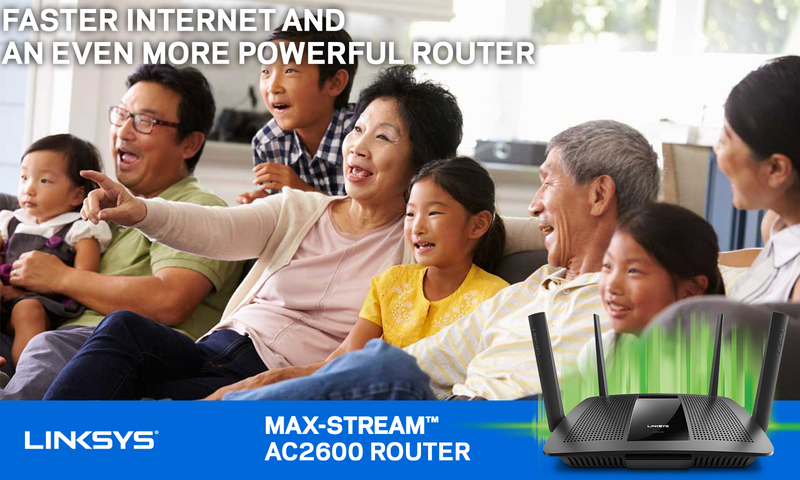 In time, you’ll forget about the buffering icon, since the Linksys EA8100-AH MAX-STREAM AC2600 Multi User-MIMO Router creates a smooth conduit that instantly delivers movies, TV shows and live sports broadcast. But think beyond the TV. Imagine what you can achieve with an amazing connection. StarHub and Linksys can bring a new world of entertainment straight to you, creating a smooth wireless music streaming experience as you play a soothing jazz track across all your wireless speakers linked via the Wi-Fi network. Or perhaps it’s the instantaneous, low latency network that gives you the edge when it comes to online gaming. Sibling rivalry in the way just because they’re each trying to hog the network to stream movies and play game at the same time? Not a problem, because there’s enough to go around. The Linksys EA8100-AH MAX-STREAM AC2600 Multi User-MIMO Router fully delivers StarHub’s 1Gbps Fibre Broadband bandwidth across multiple users simultaneously, much like two supercars running at full speed on a multi-lane highway. With this, even mum and dad can stream another movie while the kids are entertaining themselves on the internet simultaneously. Treat yourself to an ultra-fast internet connection by StarHub and Linksys. For more information on StarHub broadband plans, please click here.